There are two missing links in the Kenya Sevens team which played in Dubai and South Africa. Kenya sevens missed the services of a natural scrum-half and playmaker. It does not need a rocket scientist to know that Kenya Sevens badly needs these two players. 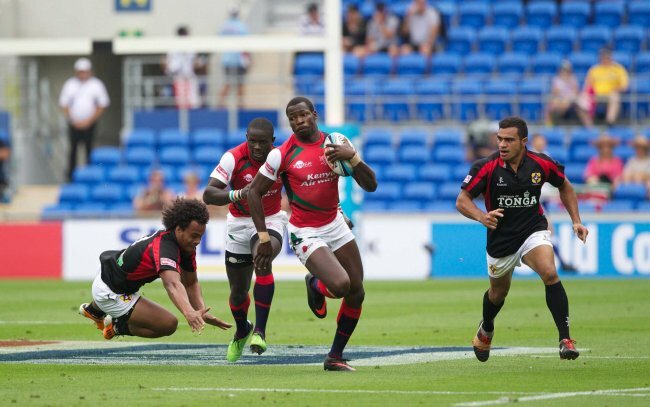 Physically, at full strength, Kenya can match any team as they have shown in the past by beating New Zealand, England, Samoa, Fiji, Canada and Argentina which are perhaps the most physical teams in the IRB Sevens circuit. Thanks to the coaches and the strength and conditioning coaches who have worked on this aspect of the Kenyan game. There have been lapses where Kenya has lost to teams which play on their face and deny them possession such as Scotland, Wales, Australia, Fiji, Argentina and New Zealand. I believe this is called rushed defence where the opponents know their opponents are dangerous out wide and would like to cut that supply before the ball reaches the scrum-half. With the physicality came a compromise which is the attacking flair which Kenya has been known for. Although there was no considerable proof that Kenya has lost the attacking flair, TV commentators noticed Kenyan players had bulked and fancied their chances against physical sides (sometimes going into contact unnecessarily when the best option would have been to use their pace on the outside. It is easy to say this because the player with the ball dictates what happens. Controlling the pace and direction of the game rests on either the scrum-half or the playmaker. The player who is able to see the small gaps or switch the direction of attack. A player who is able to hold onto the ball for a fraction of a second and ensure others are ready. One player who has been able to do this is Lavin Asego, the Mwamba fly half. Previously Newton Ong’alo a former scrum half was known for his attacking prowess while Innocent Simiyu could use the small gaps and break the tackles. It is a tough job winning the ball, the forwards will tell you that. New Zealand have Tomasi Cama, South Africa (Cecil Afrika) and lately Branco Du Preez. The match against Fiji was a debacle. Players will tell you that fans remember you by your last performance. Like any other core team, Kenya is trying to introduce new players. The difference is whether the players are eager to give the coaches a reason to keep them in the team. Are such players just happy to step on the pitch to ‘gain experience’ and therefore miss tackles? Are they there to cement their places and play like they will not have another chance? Gordon Tietjens has discovered new talent which he blends with experience. Well, some Kenyan players are on record saying they want to step in the boots of ‘old guards’ which is a good ambition. No coach is going to hand you this on a silver player. No ‘old guard’ is not going to step aside without a fight. At the moment, when all players are available, Paul Treu could pick a winning side which will give other core teams a run for their money. He knows the players. But will this help in the long term which appears to be his focus? Certainly not! Let us get the missing link and study what the other teams do. To those two players who have forced their way into the team, well done. To the rest….you have to earn the national team jersey! Put your act together and decide whether you want to wear the jersey proudly! It’s up to you.